Over the past two years, Rachel Fernandes, one of the Gershwin Initiative’s undergraduate assistants, explored some of George and Ira Gershwins’ most successful Broadway songs and a handful of near-misses. In the final post of the “What Makes a Hit” series, Rachel summarizes her findings and shares her views on what makes a hit! George and Ira Gershwin are two of the most celebrated figures in American music, but not all of their songs were major hits in the 1920s and ’30s, and even fewer are still being listened to today. Over the past two years, I studied four of the Gershwins’ Broadway songs—“’S Wonderful,” “Funny Face,” “Cactus Time in Arizona,” and “I Got Rhythm”—to discover what made each piece sink or swim. I focused on the partnership of George and Ira to understand how their close collaboration factored in to the production of their most popular songs. In addition to the brothers’ working relationship, I explored each song’s musical characteristics. I measured the success of each song by its overall longevity, whether or not it was used in any other Gershwin musicals, and the number of times it was recorded by subsequent artists. I also completed a critical survey of the cultural context and recording history of these Gershwin tunes in order to determine whether factors outside of musical and lyrical composition contributed to a work’s success. The years of his greatest popularity were those of the Depression. And since Gershwin was rarely given to sad songs, what could have been a more welcome palliative for the natural gloom of the times than the insistently cheery sound of his music? Wilder’s implication—that factors outside of the actual composition of a hit tune helped shape its popularity—became the lens for my research. I decided to explore both the songs’ musical characteristics and the historical events surrounding them to discover the distinct elements that made these works so popular. My analysis focused on three things: George’s music, Ira’s lyrics, and the external factors surrounding the song’s composition and immediate reception. “’S Wonderful,” written in 1927 for the musical Funny Face, is one of George and Ira’s biggest hits. Ira’s iconic lyrics play on American colloquialism, especially through his intentional de-formalization of the phrase “It’s wonderful.” Those lyrics were then enhanced by George’s simple melody line, which consisted of lilting, swung eighth notes and repeated phrases. The combination of Ira’s lyrics and George’s melody created a hit song. Neither a hit nor a miss, “Funny Face” was popularized by actor-singer Fred Astaire, but enjoyed only a lukewarm reception by successive artists. Despite being the title song of both the musical Funny Face (1927) and the loosely-based 1957 film adaptation by the same name (both of which starred Fred Astaire), “Funny Face” was performed infrequently by other singers. George and Ira composed the music and lyrics to fit Astaire’s unique singing style, making “Funny Face” a song that was—and still is—hard for other artists to successfully cover. “Cactus Time in Arizona,” written by the Gershwin brothers for the musical Girl Crazy in 1930 and performed by the show’s leading lady, Ginger Rogers, is a more obscure song that was never used in any other Gershwin shows and rarely recorded by subsequent artists—both important measures of success. Though this tune is charming and packed with many elements of a Gershwin hit, including bright, consonant harmonization, a catchy melody line, and a memorable title repeated throughout the chorus, “Cactus Time” is a classic example of how external factors can ultimately determine a work’s fate. Unlike “Cactus Time in Arizona,” “I Got Rhythm,” also from Girl Crazy, is among George and Ira’s most popular songs and has been recorded by many performers. “I Got Rhythm” is known for Ira’s unique lyrics and the song’s significance to jazz composition. In fact, George’s chord progressions and harmonizations in this song ultimately formed the basis for an entirely new system of jazz composition known as rhythm changes. The Gershwin brothers wrote many hits, but this song stands apart from the rest for its influence on jazz in the 1930s, 40s, 50s and beyond. “I Got Rhythm” is more than just a hit song; it has become a part of a larger tradition of music-making in jazz and influenced notions of musical creativity and innovation. Even though I worked from a small sample of songs, my work has confirmed that rhythm, rhyme, and catchy melodies are contributing factors to the success of a song. But I would also argue that a “hit” is defined by the whims of performers and public preference. For example, both “Funny Face” and “Cactus Time in Arizona” had all the qualities of a popular Gershwin song, but since neither work gained much traction with subsequent musicians, they didn’t enjoy the same kind of longevity as “’S Wonderful” or “I Got Rhythm.” The fickle public and performers’ interest can define a song’s legacy. George and Ira form one of the most successful composer-writer partnerships in American music history, but my research has proven that even the same song team working with the same elements can compose a hit as easily as a flop. The success of a song is most strongly dependent on the whims of performers and public preference—that’s what makes a Gershwin hit! 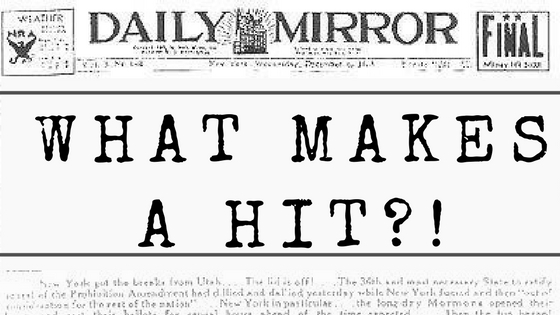 Missed one of our “What Makes a Hit” posts? Check out the complete series! ‘I Got Rhythm’: Who Could Ask for a Better Hit?